“The first sophisticated historical account of the growth of a social science discipline in the United States.” —James Reed, New York University Press. “Certainly one can cite no finer recent study of psychology’s past . . . His book thus represents revisionist history of science at its best.” —Michael Sokal, Science. “The landscape of the history of psychology in the United States has broadened and deepened as a result.” —William R. Woodward, Bulletin of the History of Medicine. “O’Donnell has written a persuasively iconoclastic book.” —Joseph Kett, Journal of Interdisciplinary History. “[O’Donnell’s] approach is so broad that the work is virtually an imaginative rewrite of the general history of American psychology . . . , an insightful new interpretation.” —John C. Burnham, Isis. 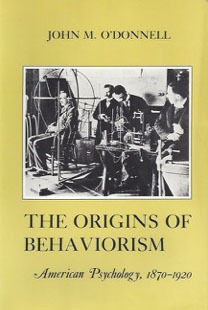 “The Origins of Behaviorism is a major contribution not only to the history of science but to American social history.” —Editors, The American Social Experience. “This work . . . signaled and catalyzed a significant change in scholarship.” —Phillip J. Pauly, Journal of the History of the Behavioral Sciences. “O’Donnell tells this story with sophistication, insight, style and wit. It is a good and satisfying story, really.” —Roger Schnaitter, Contemporary Psychology. 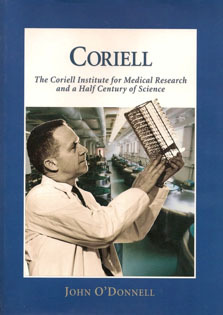 “O’Donnell’s account not only chronicles the contributions of Dr. Coriell and his Institute to the state, region, nation, and scientific world, but also illuminates the critical and insufficiently appreciated role of the independent research institute in the history of biomedical investigation in the United States. More than a standard company history, the work—like the Institute itself—constitutes a window through which to view the development of American biomedical science in the last half of the twentieth century.”—From the book’s dust jacket. I shall not bore you with academic references to other books, contributions to books, articles, reviews, professional papers, and so forth. If you are interested, please email me or join my blog. While I take pride in these well-received works, they’re irrelevant to my passionate avocation as a novelist and—probably—to the reasons you have checked out this site. I’m currently writing the sequel to Revenge At Elsinore. Though my historical research convinced me that Shakespeare was clearly aware of the saga of the Swedish rebellion against Denmark, I wished to invent a story to explain why he inserted “Horatio’s Tale” into his drama Hamlet. The two historically plausible explanations are not dramatically compelling—and I’m beginning to realize myself more novelist than historian, and so I’ll begin to make more things up, while staying true to the historical record. Here’s a sneak preview of the plot. As foreshadowed by Magnus’s prologue to his memoir in Revenge At Elsinore, his daughter Brigitta will travel to Elizabethan England to find a playwright to broadcast her father’s tale to the world. Her venture is perforce clandestine. Queen Elizabeth is fending off Jesuitical assassination plots for her toleration of Protestantism. And she’s courting Denmark as an ally. Her Master of Revels—the royal machine’s literary censor—would surely penalize severely any dramatist whose play bolstered Lutheranism and sullied Denmark’s reputation. And that is precisely the currency of Magnus Vasa’s memoir. Brigitta learns this lesson at the expense of others. The great playwrights Thomas Kyd and Christopher Marlowe died as direct results of her quest. One up-and-coming playwright remained on stage. Will Shakespeare embraced Brigitta before he embraced her father’s memoir. They became lovers. He could not without threat to his career—and possibly his life—stage her father’s story as conveyed to him. And so he disguised it within the contemporaneously popular genre of “revenge tragedies.” The result—centuries later—was a great play fraught with perplexing inconsistencies. The yet untitled sequel is a tale of love and compromise. That it sheds light on issues of interest to Shakespeareans and scholars is, as they say, “purely coincidental.” Stay tuned to my Blog.